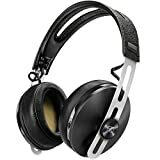 Great headphones with a solid design and great sound quality. A little bass heavy for most types of music though. The Ultrasone HFI 580 S-Logic makes a beautiful audio signature that sounds a lot like a stereo. It also promises an integrated surround sound. Music using this headphone would sound punchy and tight, but it is not harsh to the ears. The S Logic technology of Ultrasone which is also incorporated in the HFI 580 changes the tonal balance of the sound in a very subtle way, giving the impression of a much livelier sound. 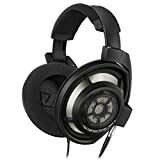 It is available at a very reasonable price of $199, the audio sounds accurate and crisp, and without the usual reverb that comes with the surround sound most of the time. Ultrasone HFI 580 is a full size headphone and it goes all the way around your ears. The ear cup is large enough and it has foam leatherette ear pads that feel a little firm. It has a matte finish in a black color with silver accents. The earcups can be swiveled horizontally at about 60 degrees and 170 degrees vertically, thus allowing a single ear listening. It can reduce or block noise by about 10 dB and it plays music at a comfortable level. The MU metal buffer board that is also equipped in this headphone can protect the brain the electromagnetic radiation that is emitted from the driver. Ultrasone also claims that is can decrease the level of sound pressure within the ear cup at about 3 to 4 dB without changing the loudness and the quality of the acoustics. The HFI 580 blocks out noise nicely using a safe and healthy means. It has an abundant bass power, offers a forgivable treble and it is a good choice for either casual or critical listening. It has enough good qualities which makes it an attractive choice.